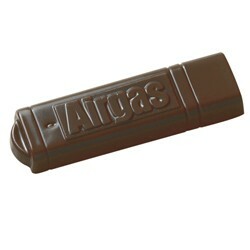 The 1 oz Custom Chocolate USB Memory Stick or Zip Drive or Flash. Celebrate changing technology Choose Milk or Dark Chocolate. The USB memory stick, zip drive or flash drive comes Individually Cello Sealed. The imprint area on the chocolate is 1/2" x 3"
Size : 3 " x 4/5"